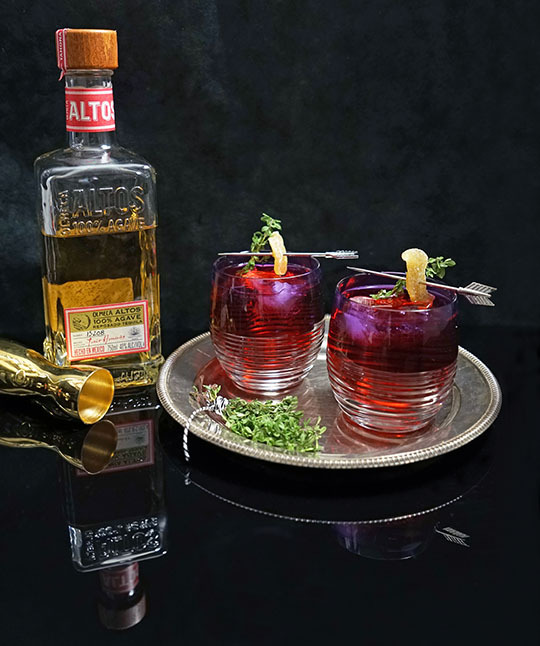 Today I am kicking off a series of cocktail and entertaining posts in partnership with Olmeca Altos Tequila, and I am really excited to create some new recipes that I think you will love using Altos Plata and Altos Reposado. 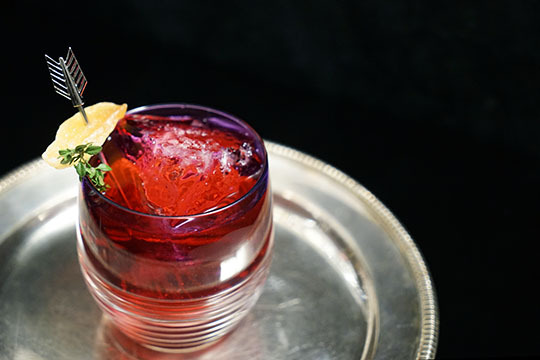 My first recipe is a Hibiscus Ginger Tequila and Tonic that is perfect for warmer months and is easy to make - a wonderful libation for summer parties or to serve as a pre-dinner cocktail at home. Cheers! Busy days call for simple cocktails. One of my favorite simple cocktails as of late is a T.N.T. - Tequila and Tonic - a cousin of the familiar classic, the Gin and Tonic. A T.N.T. is typically made with Reposado Tequila, high quality tonic, a big squeeze of lime, and sometimes a few dashes of bitters - a bright and piquant cocktail that is always surprising and satisfying. Sometimes you need a bit more kick in a cocktail. Today I'm using Hibiscus and Ginger to take this T.N.T. 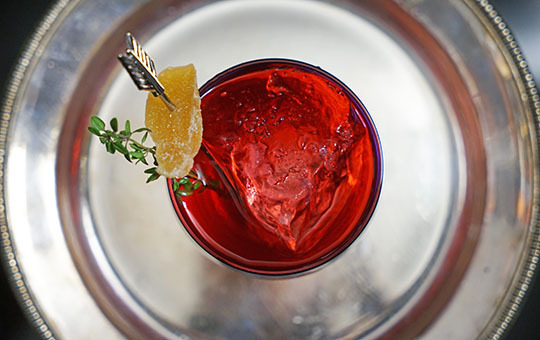 to the next level, and to add a layer of sweetness and spiciness to the cocktail. 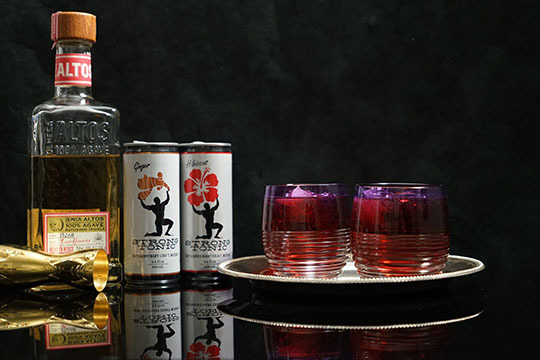 Fortunately for all of us with jobs and no patience to make our own tonic, Strong Tonic makes both a Hibiscus and a Ginger Tonic (both of which come in convenient ready-to-serve cans) making this cocktail incredibly easy to make. 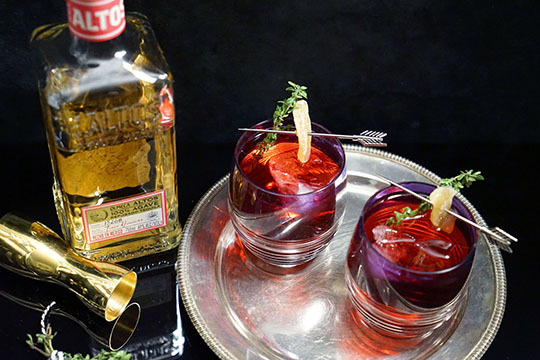 I used Altos Reposado Tequila for this cocktail, a tequila that is roasted and aged for 6-8 months in ex-bourbon casks, bringing a round sweetness to the tequila and flavors of vanilla and baking spices that work gorgeously with the flavors of ginger and hibiscus. Traditionally, a Tequila and Tonic is garnished with a squeeze of lime juice, an essential ingredient to the brightness of the cocktail. 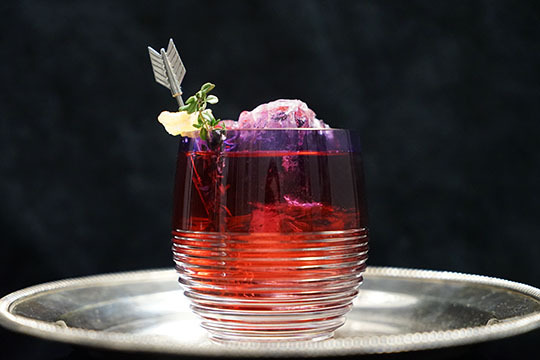 I chose to garnish this variation with candied ginger and fresh thyme because I wanted to introduce an herbal note to cut through the sweetness of the hibiscus, and have a sweet and spicy treat at the end of the cocktail. If you love ginger, you can always add an ounce of a ginger liqueur to really take this cocktail up a notch. 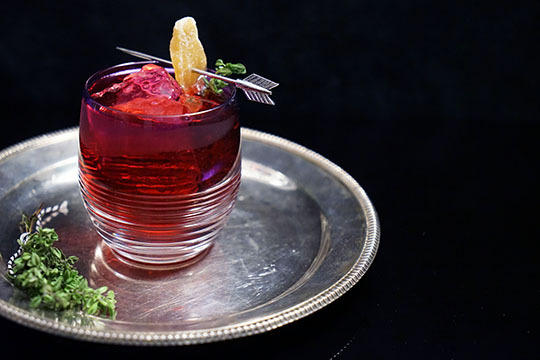 Build in a glass with large ice cubes, stir, and garnish with a piece of candied ginger and a sprig of fresh thyme. I hope you enjoy this cocktail as much as I do. Stay tuned for the entire Altos series on Gastronomista. 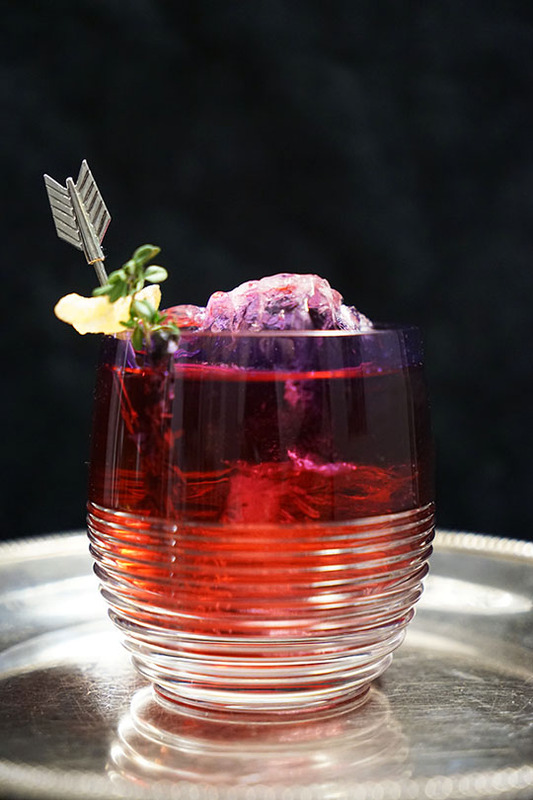 If you have any recipe requests, please leave a comment below - there are lots of drinks to come!